Following a Packers touchdown that brought the score to within 14 points in the third quarter, McCarthy called for an onside kick. Onside kicks are surprisingly successful when unexpected, averaging a 60% successful recovery rate. In this instance, it worked, and the Packers were on their way to another touchdown drive. And just as important, it kept the ball out of the hands of the potent Cardinals offense. Later in the drive following the onside recovery, the Packers faced a 4th and 1 from the .McCarthy called for a run, which converted, keeping the drive alive and, again, kept the ball out of the Kurt Warner's hands. Fourth down and 1s are converted just over 70% of the time, while a punt only makes Warner's task slightly harder. On a 4th and 5 from the 30, McCarthy again went for the conversion. Again it was successful, and this time the the play turns into a 30-yard touchdown pass, making the score 38-31. Tactically, each one of these calls was smart, but the actual numbers are surprisingly low. In total, they only bought about +0.10 WP (win probability). This is only because the Packers' chances of winning were still very low despite the successful gambles. Going from 0.03 WP to 0.06 WP doubles a team's chances of winning, but only nets a +0.03 WP in technical terms. Plus, with the scoreboard blowing fuzes keeping up with the scoring, possession becomes even more important. My conventional WP model understates the advantage of McCarthy's decisions. A 45-45 game is clearly not about field position, but about keeping possession and scoring touchdowns. The bigger the advantage that offenses have over defenses, the more punts and field goals lose their value. Should the Packers have pulled a "Tomlin" and attempted another onside kick after their final TD? They scored with too much time on the clock, and an epic choke by Rackers is the only reason they didn't lose in regulation. I'm curious about another decision McCarthy made. How does a two-point conversion measure out with 90 seconds left? I assume it's close to a wash, but given the way the offenses were playing it was a viable option. I'm wondering if something even more brazen was called for after the final Packers TD: a 2-point try at 37-38. I doubt the math supports it, because you lose with a field goal no matter what. Still, I wonder what the numbers are on 2-point conversions. The issue comes up a lot in college with the first OT, when, even if the team to first possess the balls scores a TD, the team that goes second can win it outright with a 2-pt conversion, a la Boise State in 2007 against OK. Same idea, same comment time...except I meant 44-45. Sorry. One important thing about college and the 1st OT. The team that gets to play defense first in the following OT (aka the other team) has a 55% chance of winning. I'd also guess that college kickers are slightly less accurate on extra points. Probably something like 96%. That makes the overall probability of winning by kicking 43%. A 43% bar is probably low enough that going makes sense the vast majority of the time. In the NFL, you have to assume that the Cardinals won't score in the final 90 seconds. If they score, they win regardless of whether you went for two or one. So it only matters if they don't score. Each team would have a 50% chance of winning in OT. So the bar for going is set at 50%. That means the Packers probably did the correct thing in not going for two. I think that the difference in OT rules makes a huge difference for making this decision. In my opinion, there is no way this game would have been remotely close if it wasn't for the bold moves. The problem with onside kicks and fourth downs is that people seem to remember the failures more than the successes. People should remember this game as a time when it really worked. "The Packers' season came to an UPBRUPT end..."
I assume you mean "abrupt"? Thanks. I give my editor time off late on Sunday nights. >> In the NFL, you have to assume that the Cardinals won't score in the final 90 seconds. If they score, they win regardless of whether you went for two or one. So it only matters if they don't score. The thing is though, that if GB makes a two-point conversion, then Arizona is more likely to score, since they know they have to. If the game is tied, then Arizona has the option to play for OT. If Arizona is down one, then they'll pull out all the stops to score, by going for 4th downs and so on. I think this argues against going for 2. "The bigger the advantage that offenses have over defenses, the more punts and field goals lose their value." My take is that the 2 pt conversion for GB after the TD making it 45-44 would be about as good as a PAT as far as WP. Just depends on the percentages you use. I think an onsides kick would have been the corect decision for GB with score tied at 45 if you assume a 60% onside success rate. Should the Packers have slowed it down and run some clock once they got the first down after the 2:00 warning? While you never want to pass up an opportunity to score a touchdown, I thought it would have been smarter to run it on first down in an effort to make it the last possession of the game. As was demonstrated, 90 seconds was more than enough time for the Cards to march down the field and score, if weren't for a blown FG. You're totally right. Thats another reason not to go for two. If all coaches were completely rational then this wouldn't be an issue. The Cardinals wouldn't play for OT unless the likelihood of the Packers scoring in regulation was higher than the likelihood of them scoring in reg. However, we all know all coaches aren't entirely rational and the Cardinals would be likely to play for the tie sooner than they should. The extra point was the right call there. An onside kick would have been interesting there, but I don't think it would have had a 60% success rate. If a team has been beat with something early in the game, they tend to defend against it more later in the game. I don't think it would have come across as a surprise to the same degree Tomlin's did. Also part of Tomlin's calculus was the possibility of getting the ball back if they did score. That wouldn't have happened this time. A failed kick would have resulted in an almost certain loss. Maybe. That's really hard to say without looking at each play and throwing in a good bit of conjecture. But, one thing that needs to be considered is that using up a first down isn't as costly as you might think. For one thing, it might help keep the ARI pass rush honest and help make subsequent pass plays easier. But more importantly, GB was 7-points down, and therefore in 4-down mode at that point. They wouldn't be using up a third of their downs, but only a quarter of them. They still have 3 downs to work with, and quite probably a lot less than 10 yards needed to convert and run down the clock even more. Even if they can't run out the clock all together, they could force ARI to use timeouts, or make the task that much more difficult by working the clock down below 60 sec remaining. As a GB fan, that hurt but I was so proud of McCarthy for having the stones/smarts to go for that onside kick. I immediately thought of you, Brian! And as far as onside kicking at 45 - 45.....I think the element of surprise was greatly diminished after the first onside kick. AZ had a hands team in there on a few kickoffs late - not sure if they did when the scored was tied. Not sure about the 2-pt conversion. I was wondering the same thing when it happened. I don't have the numbers handy, but think of it this way: either way, GB absolutely needs to stop ARI from scoring on the last drive in order to win. So let's assume they will. Now the question is: do I have a better shot at getting the 2-pt try, or do I have a better shot in OT? I gotta think that OT is 50/50--neither team appeared much stronger than the other at that point. So what's the chances of getting the 2-pt try, better or worse than 50/50? That would be the answer. League-wide it's slightly less than 50%, but the GB offense certainly looked to have an edge on the ARI def. Onside kick was a good move. However, they should have done it after every TD since McCarthy forgot to bring the defense to the game. 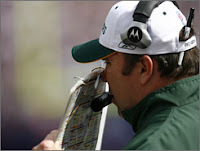 Brian, doesn't the below 50% 2-point conversion rate stat include all botched XP snaps as failed conversions? I thought that the conversion rate was over 50% when you only consider plays that don't start in FG formation. Even setting that aside, typical statistics for offensive/defensive parity do not apply to a 45-45 game. Right, it's actually 44% (or so) including the aborted kicks, so I'm estimating 'slightly less than 50%' for the league for actual 2-pt attempts. I'd need to do some work to comb through each one to remove the aborted kicks from the sample. Usually the play-by-play says '(kick formation) So-and-so right end to the SEA 3 for a -1 yard gain.' So I could pull them out. Does anyone know if there are good numbers from a large sample elsewhere? In one of the FO Prospectus books maybe? Brian- I have a minor (hopefully constructive) criticism of your Win Probability Graphs. The graph for this game says that the Packers had a 53% chance of winning following the touchback in OT. That may be the case for the typical NFL OT game, but everyone watching this particular game had to believe the Packers had at least a 70% chance of winning at that point. Have you considered altering your WP model to account for team-specific and/or game-specific factors (such as OFF and DEF efficiency and weather conditions) in order to derive a more realistic WP versus the current model? Also, am I correct in assuming that your current model only factors in score margin, and not total score? If that is the case, I have to point out that there is a big difference between a 45-38 lead and a 14-7 lead with 5 minutes to play even though they are the same margin. We have to assume the team that already scored 38 points will be more likely to score a touchdown in this situation. Please redirect me if you have already addressed this somewhere else. Thanks. A (related, I hope) question came up during the game: At some point in the second half (sorry I can't be more accurate) the Cardinals ran a play on first down for no gain, but there was a five yard penalty (illegal formation, maybe). The Packers took the yards but it seemed to me a terrible decision at the time. Against an an offense that's being successful against you (to say the least), wouldn't you rather have 2nd and 10 over 1st and 15? The Cardinals ran 57 plays for 531 yards: that's more than 9 yards a play. The Packers averaged more than 7 yards per play. I'm sure there's more to the analysis, but It just seems very obvious that if the team you're playing is averaging more than 5 yards a play, you're better off on 2nd and 10 than 1st and 15. Brett-That's possible, but like you allude to, it could be 0.70, or 0.80 or 0.65. Who knows, without a really deep analysis. When we start making adjustments here and there, the estimates start to get really shaky. Maybe one day when I have more time...a lot more time. Pete-Yes. Great point. The answer is almost always to take away the down, even when it's a 10yd penalty. Downs are priceless, especially the way ARI was playing last night. Coaches appear to undervalue downs in general, on penalties and when making 4th down decisions. The only time I'd say you take the yards is when you'd knock a team out of FG range. I think in the "day," field position mattered as much as possession. That's why we have the conventional wisdom of playing a field position game with lots of punting and trading downs for penalty yards. I don't think anyone not reading this blog would have even fathomed an onside kick in that situation. So I think GB had a 60% recovery rate. My guess is that the way Ari was playing and with the time on the clock, they would have had a 95% chance of winning in regulation if they recovered the kick. So in a surprise onside kick they had a 38% chance of winning in regulation. Assuming GB had a 65% chance of driving for a field goal if they recovered, then they would have a 39% chance of winning in regulation. I think it was probably more like 75% which gives a 45% chance of winning in regulation. I am confused about how to figure in overtime, but it seems like an onside kick raised GB's WP to over 50%, while Brian's real time WP for GB right before the real kick was around 30%. Another questionable call was for Rackers to kick on first down with time on the clock. Couldn't they just spike the ball three times first, or would that be grounding for some reason i don't understand? Obviously it didn't matter because he missed the kick and GB downed the ball, but if he had made the kick GB would have had one last trick play return. I guess the question is between taking the chance of screwing something up and the probability of a trick play working. Brian, this is off topic, but here goes: when you predict games do you just use GWP and homefield advantage, or do you compare OPass to DPass etc. to factor in, oh let's say, one of the best passing offenses and worst rushing defenses is playing the best passing defense and best rushing offense? James-Good question. The short answer is no. What you're referring to is an interaction model. I experimented with models that considered interactions between teams very good in one thing, say passing, vs. a team that's bad in stopping it. Unfortunately, those models didn't add any predictive power, but they did add a lot of compexity, so I set them aside. I'm still not 100% convinced that the right kind of interaction model wouldn't be more accurate though. I don't know if I have ever seen such a perfectly executed onsides kick. Throw out the percentages ... Ari would of had a hard time recovering that even with the all hands team out there. This a comment on the execution of the onsides. Why don't teams place flat on the tee and blast a "dodgeball" kick at a specific player? Andy - I think the reason for kicking that early, when it's first down, is that it gives you a "do-over" in case the snap goes bad. In the event of a bad snap, the holder can spike it, and you try again on second down. Brian, I don't know if FO has those stats in a Prospectus; if they don't, they may be able to calculate success rate using the data from the game charting project. It's probably worth asking them. Mister, I'd guess that accuracy with a flat ball would be worse than with a vertical ball, and in addition to that, you'd essentially be betting the entire success of the kick on a) kicking it directly at someone and b) that player not catching it. Laying the football in such a way as to point at a player would be a tipoff; he could simply move out of the way prior to the kick. The kicker could change the target on his approach, but would probably get much less velocity on the kick, which makes b) much less likely.